Whatever your level of education, you will need to know how to calculate your grade point average (usually called a GPA) in order to apply for jobs, graduate school, college or a private high school. The math is simple enough that you can perform the equations either by hand or on a standard calculator. Find out the weight your school assigns to each grade. In general, an A is worth four points, a B is worth three, a C is worth two, a D is worth one and an F is worth zero. However, your school may or may not assign more points to a B+ than to a B-. Additionally, while pass/fail courses, incomplete courses and withdrawals do not usually affect your GPA, your school may make exceptions in some cases. Your registrar's website should have this information. If not, ask your faculty adviser. Review your transcripts from the current semester, looking at both the grade you received for each class and the number of credits the class was worth. Write down the value of each grade you received, but do not add them up yet. For instance, if you earned two B's, an A and a D, you would write "3, 3, 4, 1." Multiply your grade for each class by the number of credits that class was worth. A B in a three-credit class has a value of 3 (for the grade of B) times 3 (for the number of credits), for a total of 9 points. If each of the classes in the previous example was worth three credits, you would write "9, 9, 12, 3." Add the numbers from Step 3 together. Divide that sum by the total number of credit hours you took this semester to get your average, rounding the number to the hundredth decimal place. Continuing with the current example, you would add "9 + 9 + 12 + 3" for a total of 33 points. You would divide this by 12, the total number of credits you attempted, for a GPA of 2.75. Use the same method to calculate your total cumulative GPA. In this case, you will follow Steps 2 through 4 using all of your completed coursework, rather than the courses for just one semester. If you have taken the same number of credits every semester, then you can start by calculating the grade point averages from each semester you have attended. Add them together and divide the sum by the total number of semesters to obtain your cumulative GPA. Check the weight your school assigns to each grade. In general, an A is worth four points, a B is worth three, a C is worth two, a D is worth one and an F is worth zero. However, your school may or may not assign more points to a B+ than to a B-. Also, your grades may be worth more in any honors or AP courses you are taking. Check with your homeroom teacher or guidance counselor if you aren't sure. 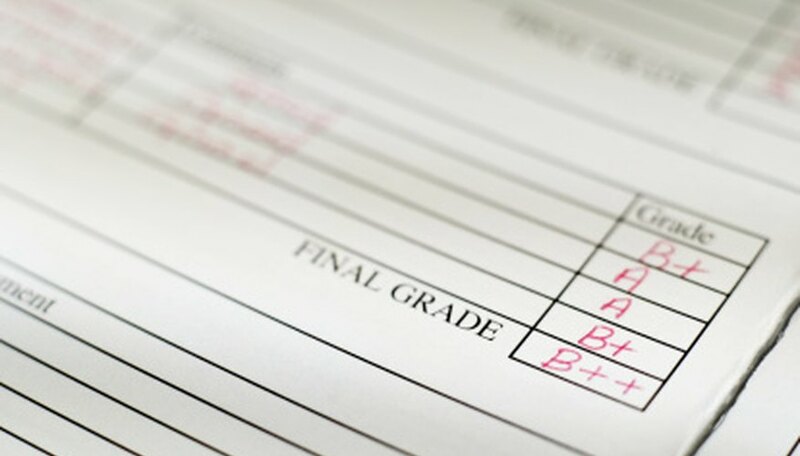 Review your report card from the most recent quarter or semester. Write down the value of each grade you received. For instance, if you earned four B's, two A's and a C, you would write "3, 3, 3, 3, 4, 4, 2." Add the numbers from Step 2 together. Divide the sum by the total number of classes you took during that quarter or semester to get your average. If you had received the report card from Step 2, you would add "3 + 3 + 3 + 3 + 4 + 4 + 2" for a total of 24 points. You would divide this by 7, the total number of classes you took, and get the number 3.428571. Rounding this to the hundredths place, you would calculate a GPA of 3.43. Repeat this step for each quarter or semester's report cards if you wish to learn your total cumulative GPA. Once you have calculated the grade point averages of each of your report cards, add them together. Divide the sum by the total number of report cards to obtain your cumulative GPA. Back to College: How to Calculate Your Grade Point Average (GPA). Kolar, Rachel. "How to Add Up Your Grade Point Average." Sciencing, https://sciencing.com/add-up-grade-point-average-8134431.html. 24 April 2017.